It’s that time of year once again. The Oscar nominations have happened and, as I posted a few weeks ago, there are a bunch more movies on my lists. Dunkirk is one of the more heavily nominated films, even if it’s not hugely represented in my pet categories. It’s hardly a shock that it garnered a bunch of technical nominations and the tremendous Hans Zimmer score was almost certainly a lock for a nomination. It’s also worth noting that as of this writing, Christopher Nolan is the smart-money bet for winning Best Director. It’s also worth noting that despite Nolan’s storied and critically-acclaimed career, this is his first nomination. 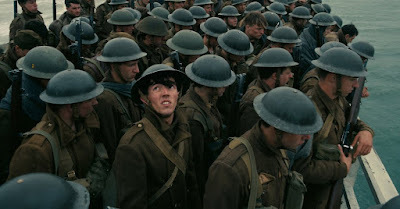 Anyone with even a little bit of World War II knowledge will be able to guess quickly that Dunkirk is the story of the mass exodus/retreat by the British Expeditionary Force in 1940. Having been pushed back literally to the coast by the Wehrmacht, the British and French troops stood waiting to be evacuated while the German military squeezed ever tighter. It remains one of the more curious military decisions that the German army allowed so much of the BEF to successfully get back to Britain. Dunkirk, probably wisely, does not attempt to tell the entire sweeping story of the Dunkirk withdrawal. Instead, it focuses on specific stories, giving us the full tale from multiple perspectives. This is both a strength and a weakness of the film. It’s a clear positive because it does give us essentially the entire story without being overwhelming. We see the plight of the men on the beach, the struggle to find a ship back to England, a bit of the air battle over the beaches, and the work of the ordinary British citizens who sailed to Dunkirk in their personal private small craft to bring home the troops. As much as it can, it tells the complete story, at least from the Allied side. But this is a weakness because, in trying to tell a complete story, it doesn’t tell all of the stories that completely. Dunkirk has an excellent cast that includes Kenneth Branagh, Mark Rylance, Tom Hardy, and Cillian Murphy, but we spend very little time with any of them. Since the film moves back and forth between the different stories happening at Dunkirk, none of the stories are filled with a great deal of depth. What this means is that at what is one of the most damaged, difficult, and emotional moments in the history of the British Empire, the film feels almost clinical. There are three main stories that interact in places. In one, troops attempt to find ways out of France and back to the UK. Tommy (Fionn Whitehead), Alex (Harry Styles, most famous as a member of One Direction), and Gibson (Aneurin Barnard), who has a secret when it comes to his attempt to leave France. These three, along with a number of other troops, have difficulty not just finding a ship to take them home, but finding one that isn’t attacked by the Luftwaffe and sunk, putting them back on the beach. A second story concerns a trio of Spitfire pilots including Collins (Jack Lowden) and Farrier (Tom Hardy), who are doing their best to keep the skies as clear as possible for their troops. The third main story has Mr. Dawson (Mark Rylance) and his son Peter (Tom Glynn-Carney) along with Peter’s friend George (Barry Keoghan) sailing to Dunkirk to rescue troops. Along the way, they encounter trouble in the shape of an unnamed shipwrecked soldier (Cillian Murphy), rescue Collins from the sea, and eventually take on our troops from the first story as well. Overseeing all of this is Commander Bolton (Kenneth Branagh), whose job appears to be making sure as many men get rescued as possible. I genuinely find Dunkirk hard to judge. It is beautifully acted and the story is compelling. From a historical perspective, there’s nothing about this that isn’t fascinating on its face. But I want to have a deeper connection with the stories and especially with the people. There are moments that happen here that are plot-designed rather than natural within the story (this is particularly true as the story impacts George), and I find that frustrating, too. Tom Hardy, who has an oxygen mask over his face in his cockpit, is virtually unrecognizable through the whole film, and is little more than just a pilot. When terrible things happen to the characters, our emotional reaction is based far more on something bad happening in general than something bad happening to someone we specifically care about. I have no doubt that Dunkirk will contend for a number of its Oscars, and it should. It wouldn’t surprise me if Nolan walked away with the Best Director Oscar, and I’m not sure he shouldn’t. But for as much as I want to be emotionally connected to this film, I simply can’t be. Dunkirk holds me too far at arm’s length. Why to watch Dunkirk: It is probably the most interesting military story of the last 100 years. Why not to watch: It feels so detached in so many ways. I personally would be heavily surprised if GDT doesn't win Best Director since he already won the Globe and the Critics' Choice. My heart will absolutely be with del Toro and always will be; he's my favorite working director. I think it might be Nolan, though--I wouldn't be surprised if he walked away with it. Honestly, I think his appeal is a lot more general than del Toro's. But I'm hoping for my boy. Del Toro also won the DGA Award, which is the key one heading into the Oscar race, so I'd say Del Toro is the frontrunner at this point. Thats not to say Nolan couldn't pull off an upset, but the odds are in GDT's favor. I'll take it. GDT needs an Oscar at some point, and while there were certainly some options in the past, The Shape of Water is probably what he needed to do to get on the podium. It's worth noting that if he does win, it will be the fourth time in the last five years that a Mexican-born director will have won Best Director at the Oscars. I thought they only sent us rapists and criminals. I really didn't like "Dunkirk," but I think your reservations and my dislike have similar roots insofar as we were both expecting something a bit more intense, gripping, or visceral. It does feel muted, doesn't it? It feels like it shouldn't be, and yet it is. I think it's a genuinely great movie, but it's always going to have that kind of mild cloud over it. To me Dunkirk felt like a tableaux. No start, no finish, just a lot of continous noise. There is no context for the story. My wife, who is unfamiliar with the evacuation was completely confused and I had to explain what was happening. Two-thirds in I started getting bored, the story just did not move anywhere. I understand that Nolan was going for a concept, but in the process he lost touch with the story he was trying to tell. I agree with you that we lacked depth, but we also badly lacked width. Instead we got an awful lot of noise. Dunkirk may well get a lot of technical award, but in my opinion the major ones should be out of reach. I don't entirely disagree with you, although I do think it's a masterful film. Nolan was definitely going for a concept, or at least something designed not to tell a story but to leave the audience with an impression of something more than a narrative. I fully understand why that doesn't necessarily work. It did for me, despite my problems with the film. I think it's genuinely a hell of a great film, although for the life of me I don't know if I wanted it to be 20 minutes shorter or two hours longer. Now That's a Busy Day!